Winter is when things calm down and you have time to reflect on the year that’s nearly over, and the year that’s ahead. In terms of planting and produce, this year has been a bit hit and miss for me. It started very well, with my new potting bench and cold frame being put to good use. This year was my first attempt at growing from seed and they grew well. I had plenty to plant in my garden, give to family or sell to the neighbours. I was really surprised at how much I enjoyed growing from seed. I’d always ruled it out before, as I’m not very patient, but I actually found it very therapeutic at times. The produce wasn’t so good. In fact it was a bit of a disaster. Nothing much came from my courgettes, cucumbers or butternut squash and I had the smallest crop of tomatoes in years. However, spinach, kale and rocket did very well and I was pleased with the few cobs of sweetcorn that grew. The plants I gave to my family did really well, so at least I know the plants I grew were ok, and I benefitted from some of the surplus courgettes and butternut squash. Soil, location and pest control were issues for me. I ran out of space, I had to put too many things in pots which didn’t like being in pots and I lacked sunny spots to plant things. I tried to use more natural products this year to prevent slugs, however they failed and the slugs had a banquet. So, I gave up and used slug pellets to save the remaining plants. Our 3 chickens increased to 5 and produced plenty of eggs for the two of us this year, and we sold quite a few boxes to friends and neighbours.We’ve received lots of compliments about how tasty the eggs are, which is nice to hear. I should probably also mention that we were busy getting married this year too! 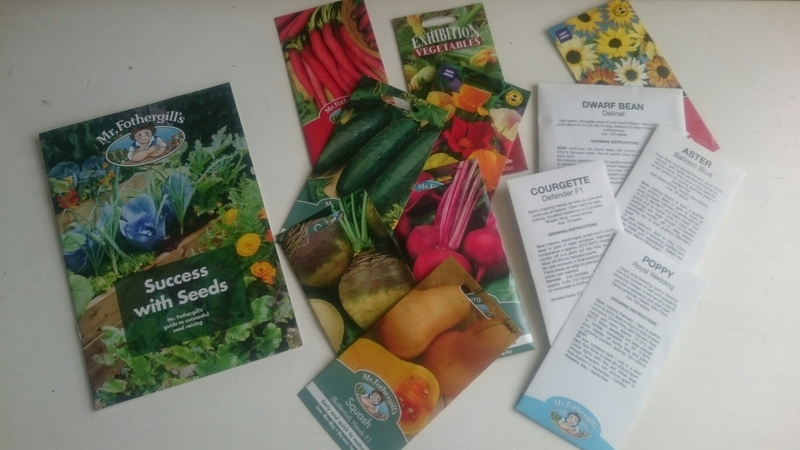 Growing from seed using my cold frame worked well, so I will continue with that method and I’ve already started buying seeds for next year. Mr Fothergill’s has had some great offers online recently (http://www.mr-fothergills.co.uk/). I have some new raised beds coming in the new year, which I will use for smaller crops such as beetroot, kale, spinach etc. This way I can put them in a sunnier position and give them better soil. Thanks to the chickens, I also have plenty of compost to add to the mix. My courgettes and squash may also need to go into raised beds for this reason, although they will take up a lot of space. Tomatoes worked ok in pots, so will continue with this, but look for better varieties. For pest control, next year I will try beer traps and gravel, as I hear they work well, and if they fail the slug pellets will be out again. I think I’ll also wait until the plants are a little bigger before planting them out, so they have more of a fighting chance. We have no plans to get more chickens, but then again, we had no plans to get two more this year until we saw the local RSPCA centre had rescue battery hens that needed new homes (http://www.westdorsetrspca.org/taylors.htm). So glad we did, they’re lovely girls. Our goal to move house is unlikely to happen in the coming year, despite rapidly running out of space, but we’ll continue to look for the perfect smallholding, just in case. Whatever your plans are for 2017, good luck.